2017-05-24 4:30:00 2017-05-24 6:30:00 Happy Hour with Sike! Do you think that the key to a great week is a great happy hour? We sure do, so we’re teaming up with Phil Shafer (aka Sike from Sike Style Industries) to bring you a mid-week happy hour full of creativity and color. Phil Shafer is a crazy impressive muralist with an awesome creative process. Together, we’ll be taking you on a tour around Westport to view four of his pieces. Tour kicks off at Qdoba with the first mural & then we will continue on to see a few more, ending at miniBar who is opening up early for us! Meet us at Qdoba: Drinks will be on you (with HH pricing) and snacks will be on us. Bring a friend, we’ll see you there! Phil Shafer aka Sike Style, channels his creative energy in many ways. For 15 years, he has run his successful art business Sike Style Industries while working full-time as a designer for the Kansas Life Science Research Center at the University of Kansas Medical Center. His creative practice includes fine art paintings, 2D design on walls and print graphics. Recently, his love of street art and graffiti has lead him to community engaged projects as a muralist. 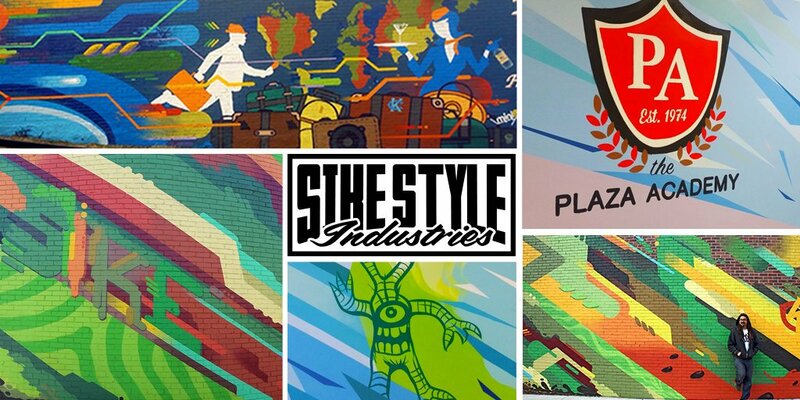 Murals allow Shafer to transform bland or vandalized surfaces with colorful, positive and uplifting imagery that inspire pride in the nearby communities. Shafer has been awarded commissions from: Qdoba Restaurants, the Kansas City Art in the Loop foundation & the Kansas City Royals and is a featured artists in the 2016 Kansas City Collection. He earned his BFA in Photography from the Kansas City Art Institute. An enormous thank you to Qdoba and miniBar!